The School programme, delivered by Salle Kiss Fencing Club, has provided a valuable educational experience for schools and communities throughout the North West Region for over eight years. Fencing is a European martial art, that is both physically and mentally challenging, but with a touch of glamour! The sport requires speed, fitness and the ability to out-think your opponent. Consequently, fencing not only improves a child’s physical fitness but can also helps to improve concentration and mental agility, including reaction time, hand-eye co-ordination, flexibility, observation and focus. Thank you to Natalie Cheetham, a parent of one of our members who recently sent us this mail. Feedback is very important to us and helps us improve a build a club for all to be proud of. First of all I would like to thank you for the confidence you have given my child and the belief in her. Also her co-ordination has improved as well as her strength. Through holding the sword her grip of her pencil and pen in school has improved as she has week hands. Sydney enjoys coming every week and as a child that had a problem in having mild dyspraxia and dyslexia it has helped with her hand eye coordination. We were told that she has a problem with spatial awareness and we are amazed how precise she is with the sword. I thank you for giving my daughter a great opportunity and would recommend it to all parents and teachers for children to have a go. With the help of the club and that there is no pressure to buy the kit my daughter has been able to attend. Our Schools programme is specially designed to further develop all of these skills in our pupils. Our Knight Award Programme works with an increasing number of primary and secondary schools, across the North West region to introduce pupils to the discipline and fun of fencing. From this programme we can also talent-spot and encourage youngsters with flair to think about pursuing the sport further. Over the last eight years, several pupils who had their first taste of fencing via our schools programme have been chosen to represent both England and at an international level. 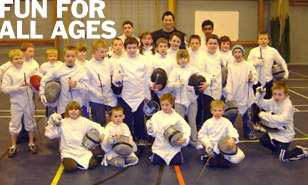 Fencing is widely enjoyed, even children who are reluctant to take part in team games often enjoy the individuality of fencing. While others enjoy the aesthetic pleasure of perfecting and performing disciplined movements correctly and studying the theory and language of fencing for Achievement Awards and Duke of Edinburgh Awards. 1. Decide which activity your school would prefer: before school, lunchtimes, after school or curriculum activity. 2. Help us to organise a (free of charge) taster session during your assembly time (25minutes), so we can generate interest and promote the sport. 3. Finding financial support for all sessions and make it feasible to run. Cost based on sources and actual possibilities. 4. With our entire supporting documents we offer a full service to help maintain the school club. (Parents introduction letters / application letters, certificates, free fencing club lesson applications). No extra work for the school secretary. 5. Provide extra publicity to your school. 1. CLUBMARK accredited. The Coaches are CRB checked. We are affiliated to governing body BFA-liability insured. All relevant coaching certificates are available TO PRESENT. 2. Lessons set for a possible 10 weeks duration, 1hour weekly sessions with newly developed mini-fencing equipment. 3. Closely linked with the National Curriculum: knowledge, skills and understanding. Developing new skills. Selecting and applying skills, tactics and compositional ideas, improving performance, fitness and health, games and skills. 4. Monitoring and improvement. Talent hunting. 1. The club has an established supported relationship with many local authorities. See below for just a few of our many satisfied educational establishments who have used our services. 2. The school programme links has a bridge to explore continuity into our local fencing clubs throughout our free of charge extra 10 weeks fencing offer for dedicated / talented children. This will provide great continuity for those children who want to carry on with the sport. We hope that you will take this opportunity to be involved in our school programme. Without your supporting help we might miss the opportunity to introduce and develop this unique sport to your school.